Small membrane-enclosed vesicles are used like cargo trucks to deliver proteins and other molecules inside and outside of cells. When these vesicles reach their proper destination, they fuse with a membrane and deliver their cargo. For instance, vesicles are used inside cells to transport digestive enzymes from the Golgi to their final location in lysosomes. They are also used to deliver molecules out of the cell: for example, neurotransmitters are released from vesicles that fuse with the cell membrane at nerve synapses. The 2013 Nobel Prize was awarded to three researchers who have revealed the central molecular machinery for this process of vesicle fusion. SNARE protein complex in the process of fusing two membranes. 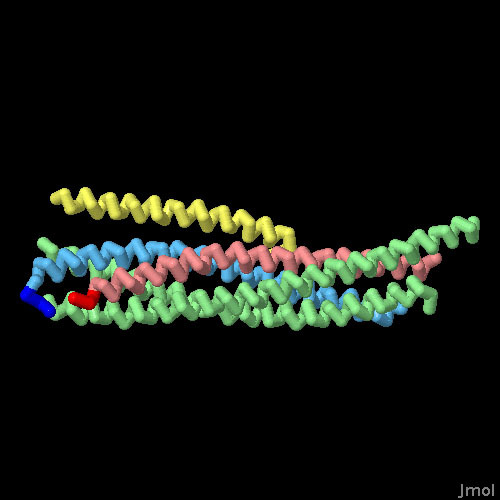 The membrane-spanning portions and a large loop in SNAP-25, which are not included in the PDB entry, are shown schematically. Vesicle fusion depends on the association of SNARE proteins that tether a vesicle to a target membrane and assist with the fusion of their lipid bilayers. SNAREs are short proteins that are bound to the surface of the vesicle and the membrane, connected by a segment that crosses the membrane or by covalently-attached lipid chains. When the SNARE proteins come together, they form a tight bundle of alpha helices that pull the membranes into close proximity. The complex shown here is from nerve synaptic vesicles, from PDB entries 1sfc and 1br0 . 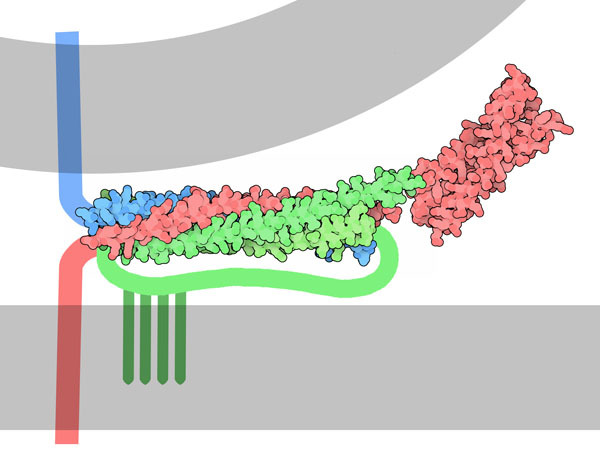 The vesicle includes the SNARE protein synaptobrevin (blue), and the cell membrane includes two SNARE proteins, syntaxin (red) and SNAP-25 (green). Experiments have shown that two or three of these SNARE complexes are sufficient to power the fusion of a vesicle with a membrane. Researchers have also discovered that the process requires the assistance of several other proteins that chaperone the SNARE proteins and regulate the time and place that fusion occurs. But that is currently where the scientific results end: the details of how the vesicle membrane lipids insert themselves into the target membrane is still one of the great mysteries of cellular biology. As with many subjects in molecular biology, the proteins involved in vesicle fusion were named based on how they were discovered. The first of these proteins was discovered by inactivating proteins with the cysteine-attacking chemical N-ethylmaleimide, and then adding proteins back one at a time until vesicle-fusing function was restored. This resulted in the discovery of NSF: N-ethylmaleimide-sensitive factor. Other proteins were then discovered by their interaction with NSF, resulting in complex names such as SNARE (soluble NSF-attachment protein receptor), and confusing nomenclature such as the acronym SNAP, which used for two different proteins with different activities: SNAP-25 (synaptosomal-associated protein) and alpha-SNAP (soluble NSF-attachment protein). So watch your step when you start traveling through the literature about these molecules...the names can be tricky! Once the SNARE proteins have done their job, they need to be disassembled and recycled for the next delivery. NSF, shown here from PDB entry 1nsf , performs this important task. 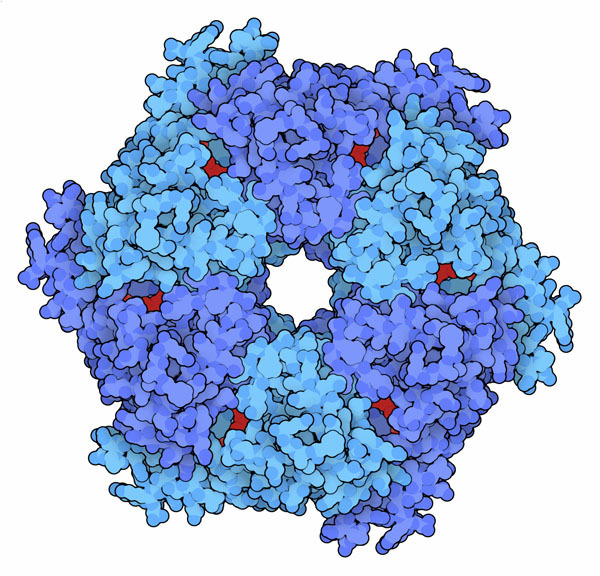 It is a member of the AAA+ class of enzymes, which use ATP to power the unfolding of proteins. Like the other members of this class, it is composed of a ring of six subunits, each with its own site for ATP binding and hydrolysis. NSF disassembles SNARE complexes by feeding the chain through the central hole. Many proteins assist the SNARE proteins in their task. Complexin, shown here in yellow in PDB entry 1kil , is part of the machinery that allows synaptic vesicles to release their contents quickly and on demand. It stabilizes the SNARE complex and is thought to hold the vesicle close to the membrane, ready to fuse on command. To explore this structure, click on the image for an interactive Jmol. You can use the "SCOP Classification" browsing option to explore the structures of other proteins that form coiled-coils similar to the SNARE complex. J. Rizo and T. S. Sudhof (2012) The membrane fusion enigma: SNAREs, Sec1/Munc18 proteins, and their accomplices--guilty as charged? Annual Review of Cell and Developmental Biology 28, 279-308. 1br0: I. Fernandez, J. Ubach, I. Dulubova, X. Zhang, T. C. Sudhof & J. Rizo (1998) Three-dimensional structure of an evolutionarily conserved N-terminal domain of syntaxin 1A. Cell 94, 841-849. 1sfc: R. B. Sutton, D. Fasshauer, R. Jahn & A. T. Brunger (1998) Crystal structure of a SNARE complex involved in synaptic exocytosis at 2.4 A resolution. Nature 395, 347-353. 1nsf: R. C. Yu, P. I. Hanson, R. Jahn & A. T. Brunger (1998) Structure of the ATP-dependent oligomerization domain of N-ethylmaleimide sensitive factor complexed with ATP. Nature Structural Biology 5, 803-811. 1kil: X. Chen, D R. Tomchick, E. Kovrigin, D. Arac, M. Machius, T. C. Sudhof & J. Rizo (2002) Three-dimensional structure of the complexin/SNARE complex. Neuron 33, 397-409.